In this article are looking at how Magento cookies can create issues with the login functionality of both the customer-facing front-end and admin back-end, the reason it occurs and how it should be resolved. This is also known as the looping issue, as the screen redirects itself to the same screen, even though the username and password is correct. A script is provided at the end of the article which can help detect a few of the issues. Feel free to use and modify as per your needs. A session is an array variable on the server side, which stores information to be used across multiple pages. For example, items added to the cart are typically saved in sessions, and when the user browses the checkout page they are read from the session. Sessions are identified by a unique ID. Its name changes depemnding on the programming language — in PHP it is called a ‘PHP Session ID’. As you might have guessed, the same PHP Session ID needs to be stored as a cookie in the client browser to relate. Magento can store sessions via multiple session providers and this can be configured in the Magento config file at app/etc/local.xml. These session providers can be chosen here. Allowing sessions to store themselves in the database is done in /app/etc/local.xml by adding <session_save><![CDATA[db]]></session_save>. Magento applications store sessions in the Core\_session table. Let's look at a few reasons why this happens, and how we should resolve those issues. After executing this query, we will get the results. Verify the 'value' column is the same as your domain. Update the value if it is not the same as your domain. See if Cookie Domain is example.com, or .example.com (note the period in front). If not, set it to .example.com. 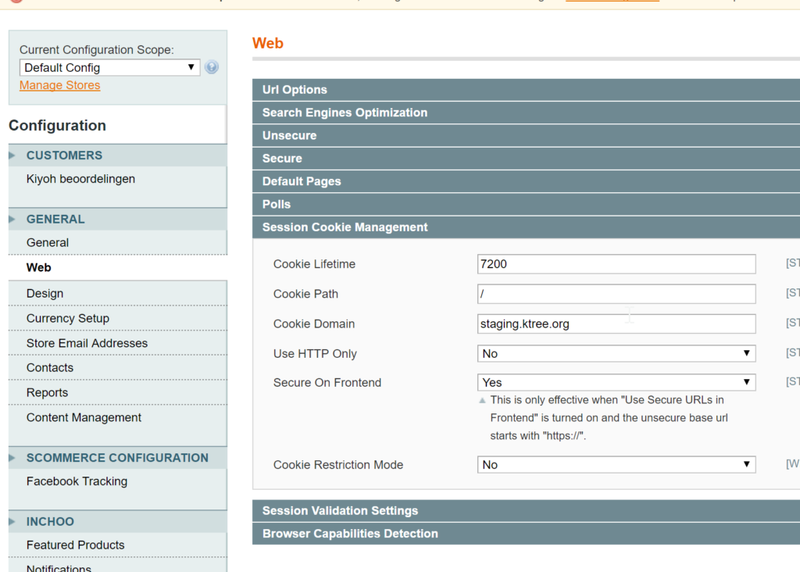 See if the Cookie Domain is www.example.com, or .www.example.com (note the period in front). If not, set it to .www.example.com. In the test.example.com shop, set the Cookie Domain to .test.example.com on the test environment. Alternatively, change this by running these sql queries. After executing the above query we will get the results. Verify whether the 'value' column is the same as your domain or not. Update the value if it is not same as your domain. This is not the recommended approach, but if all options fail you can try this code, changing the option by changing the adminhtml cookie name for subdomains. Copy the file action.php and keep it in the same folder path as local so your core code file can be overridden. There are two changes to make in the file app/code/core/Mage/Core/Controller/Varien/Action.php. In a few scenarios, there is the possibility of the system creating multiple frontend cookies, which prevents the system from allowing you to login.. When your Magento system has the same configuration for your main domain and subdomain in the Magento config, and if the user logs in to both the sites, Magento creates two cookies. One has 'Domain Value' set with the main domain, and another with the subdomain. As such we will have two front-end cookie sessions, so we won't be able to login to the system. Change the Cookie Domain setting to .example.com for both the domain and subdomain configurations. In this scenario, let’s say in your php.ini, no cookie domain is configured and the Magento Domain Value of example.com is configured. Now when the user logs in via www.example.com, the system creates a cookie with a Domain Value of example.com from the Magento config. When the user logs out, Magento will regenerate the cookie with a Domain Value from the URL accessed (i.e www.example.com), since in php.ini no cookie domain was specified. Note that if the user logs in using example.com or a cookie domain is configured in php.ini, no issues will arise. Add a cookie domain to your php.ini file that is the same as your Magento config. Change the Cookie Domain to .example.com for both domain and subdomain configurations. Note: Use our cookieTest.php script to see if you have double frontend cookies. This is an error you may see in the exception log, and might occur only for PHP7, as PHP7 does strict type checking. The solution for this is to change the Magento core read function by typecasting. More on this here. If you are running on Vagrant, you may have to make sure or change the file session path. Another reason is that there could be some old sessions in the var/sessions folder — delete them and test whether that fixes the problem. Note: If you have the option to use different session providers, switch to another. For example, go from Redis to file. Clear your var/cache folder and see if it works — and again, only try this in your development environment.